With the introduction of technology in the classroom and our current focus on formative assessment, it's easy to be overwhelmed by the amount of time needed to create materials for our classes. 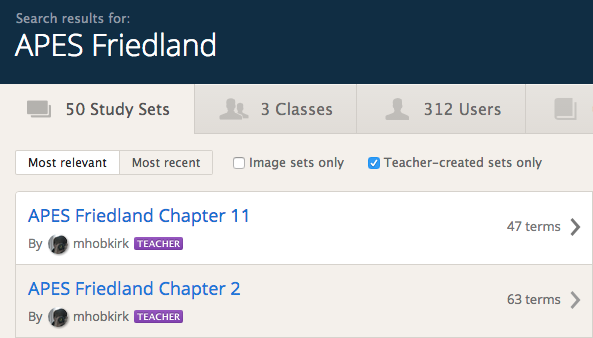 If you use Schoology, hopefully you already take advantage of sharing resources with your colleagues. Don't forget, however, that teachers everywhere are using similar resources and elect to share those resources online. Online tools such as Socrative, Quizlet, and Kahoot! let you share resources publicly. There are more 4 million public Kahoots out there that you can search through. There are over 40 million shared Quizlet Study Sets. 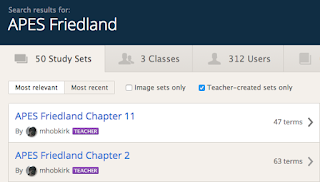 You can also search for "Teacher-created sets" only. If you follow a specific textbook, sets can be found easily. It should go without saying, that not every online resource is perfect. I often spend time revising, adding, or deleting parts of things that I find online, but I always spend less time editing than I would starting from scratch. Before you know it, you'll have a database of bellringers, study tools, and other formative assessments at your fingertips.